I absolutely love The Muppets Family Christmas special from 1989. We have it recorded from the original airing, complete with 80s commercials. I can probably quote the entire special and often do with my sisters and parents. I love the silliness of it, but also the music and the Sesame Street characters that join as well! 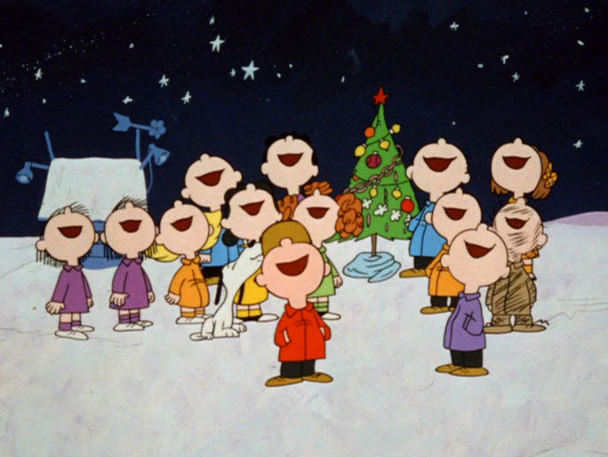 The end of A Charlie Brown Christmas when the group gathers around the tree and begins singing and humming Hark! The Herald Angels Sing. 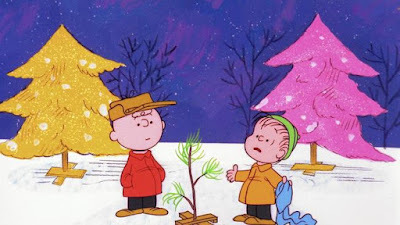 I love that they surround Charlie Brown and this little helpless tree and give them strength and acceptance. I'm tearing up right now just thinking about it!! It gives me chills. Wouldn't be Christmas without it. The Muppet Family Christmas Special's repeated refrain "Careful of the icy patch!" that everyone slips on. We joke about that every Christmas. It's so silly! I'm not much for the Christmas Carol, but I especially can't do the A Christmas Story scene at the mall with the scary Santa and slide and elves...just...no. Linus. He's thoughtful, supportive, and makes sure everyone around him is taken care of, especially Charlie Brown. I definitely relate to that and admire that about him! My two favorite parts of Muppet Family Christmas are Grover's appearance in the Christmas play as the mouse with bowl in hand -- "You will notice, no stirring." -- and the appearance of Jim Henson at the end. It's heart breaking to know that when he filmed this special, he had very little time left on this earth. Love all your Charlie Brown references! I feel the very same about that "Hark the Herald Angels Sing" moment! Truly beautiful! And, that scary Santa in A Christmas Story is creepy! It is very sweet, too, that you feel like Linus! Love that! He is such a good, loyal, faithful friend! Ooohhh Jim Henson in A Muppet Family Christmas--doing the dishes in the kitchen. 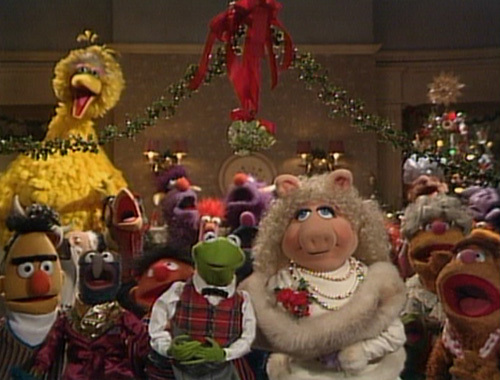 This moment is so very sweet and the perfect inclusion of all of the family members in the Muppet universe. That classic special is filled with many special moments. Thanks for reminding me about it.